This article describes the recommended minimum (and maximum) distances to separate an air conditioner or heat pump outdoor compressor/condenser unit from building walls, other equipment, fences, shrubs, etc. 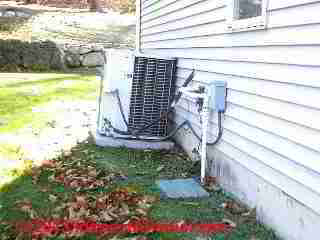 In our photo at page top these two compressor/condenser units are too close together as well as too close to the building walls. Blocking air flow through the outdoor A/C or heat pump compressor/condenser unit is a really bad idea that shortens equipment life (as the equipment runs hotter) and increases system operating costs (for the same reason - hotter operating temperature means lower efficiency during the cooling season). Air conditioning or heat pump compressor/condenser units mounted too close to a wall, surrounded by shrubs, or multiple units located too closely together will probably not receive enough cool air flow to function properly. And even worse, compressor/condenser units that are too close together not only have to fight for their incoming cooling air, but they may feed hot exhaust air to one another, increasing their operating temperatures still further. The final authority on proper HVAC equipment clearance distances is the manufacturer's installation instruction manual. But here are some general rules of thumb for air conditioner or heat pump clearances that we will cite here. A rule of thumb is to maintain at least two-feet (24") between the A./C compressor/condenser unit and any nearby obstruction such as a building wall, shrub, or fence. If there are multiple air conditioner or heat pumps installed in the same area, and following the sense of the rule above, I'd keep the units at least 4 ft. apart from one another as well. In our photo (left) from a home in New York, the compressor/condenser unit actually leaning against the house wall (its support pad tipped). About 1/3 of the air flow from this unit is completely blocked by the building wall. At least the wall kept the unit from tipping over, though. If you do not have manufacturer's installation instructions at hand we recommend following the "rules of thumb" for A/C or heat pump clearance distances given above. But of course the final authority is the equipment manufacturer. Here is an adapted (reformatted) quote of clearance requirements from a Carrier 24ANA Infinity Series Air Conditioner of 2-5 nominal ton size A/C equipment installation manual and the Lennox Elite® Seroes XC13 condensing units and other condenser installation instruction documents that you can read inPDF form at REFERENCES. When installing, allow sufficient space for airflow clearance, wiring, refrigerant piping, and service. A widely-quoted opinion is a typical minimum working distance to the controls is 36" (or 30" in the UMC) on the unit's side where controls and fittings are located. Lennox Elite® IOM (2017) requires 30" service clearance on one of the unit sides adjacent to the control box. Allow at least 48 in. (1219.2mm) above the compressor/condenser unit. Some installation instructions for split system compressor/condenser units specify 60" (150cm) above and 24" (40cm) the unit around the coil on 3 sides for air intake. Clearance between the unit and the structure (presumably a wall) can be 12"
For proper airflow, a 6-in. (152.4 mm) clearance on 1 side of unit and 12 in. (304.8 mm) on all remaining sides must be maintained. and permits 6" (15.2mm) on the final side of the unit. Whirlpool's condenser installation instructions require 24" on the service side, 12" clearance to the building, and 12" clearance on the air inlet sides of their unit. Allow at least 12" distance to a wall or fence or similar solid obstruction - typical of most installation instructions. Some instructions permit reduced clearance to a single object with a small surface area such as the end of a wall, an outside corner, a fence section, or a post. Eg. a 4" fence post could be 4" from the wall-side of the compressor/condenser unit. Maintain a distance of 24 in. (609.6 mm) between units. Some of the installation/operation manuals provided at REFERENCES permit a reduced 20" clearance between adjacent units. Position so water, snow, or ice from roof or eaves cannot fall directly on unit. Please contact your dealer to schedule proper inspection and maintenance for your equipment. Cleaning of the outdoor unit’s coil should be performed by a trained service technician. Contact your dealer and set up a schedule (preferably twice a year, but at least once a year) to inspect and service your outdoor unit. Make sure no obstructions restrict airflow to the outdoor unit. Grass clippings, leaves, or shrubs crowding the unit can cause the unit to work harder and use more energy. M1305.1 Appliance access for inspection service, repair and replacement. Appliances shall be accessible for inspection, service, repair and replacement without removing permanent construction, other appliances, or any other piping or ducts not connected to the appliance being inspected, serviced, repaired or replaced. A level working space at least 30 inches deep and 30 inches wide (762 mm by 762 mm) shall be provided in front of the control side to service an appliance. Installation of room heaters shall be permitted with at least an 18-inch (457 mm) working space. A platform shall not be required for room heaters. Sufficient access and working space shall be provided and maintained about all electrical equipment to permit ready and safe operation and maintenance of such equipment. (A) Working Space. Working space for equipment operating at 600 volts, nominal, or less to ground and likely to require examination, adjustment, servicing, or maintenance while energized shall comply with the dimensions of 110.26(A)(1), (A)(2), and (A)(3) or as required or permitted elsewhere in this Code. (1) Depth of Working Space. The depth of the working space in the direction of live parts shall not be less than that specified in Table 110.26(A)(1) unless the requirements of 110.26(A)(1)(a), (A)(1)(b), or(A)(1)(c) are met. Distances shall be measured from the exposed live parts or from the enclosure or opening if the live parts are enclosed. Table 110.26(A)(1) Working Spaces specifies the minimum clearance in front of the equipment to be 36 inches, and the clearance goes up for some conditions where the voltage to ground is 151-600 volts to ground (not seen in the typical residence). Equipment. A general term, including material, fittings, devices, appliances, luminaires, apparatus, machinery, and the like used as a part of, or in connection with, an electrical installation. Really? Legal experts whose opinions we've come across online claim that HVAC equipment will be turned "off" prior to servicing, so the NEC's equipment clearance distances that apply to "energized equipment" would not apply to an air conditioner or heat pump compressor/condenser unit. This is not quite correct. For example during charging and during some equipment tests, the HVAC equipment such as the compressor/condenser will indeed be powered on and actually running while test leads, temperature monitors, or a pressure gauge set will be attached to or used on the equipment. Are there any clearance requirements for condensing units and entrances? You mean beyond what's in the article above and specific to building entries? I haven't seen that explicit spec. beyond what's mentioned in the article above or a generic 3-foot rule to give good air circulation. Perhaps in the unit's installation guide you'll see some schematic on clearances that's different. Is this a noise complaint or an air flow concern? In my opinion and probably the opinion of your local fire or building code compliance officials, the compressor/condenser should not be located where it forms an obstruction or hazard around building entrances. Since an exit stair or door wants at least a 3-foot landing or clearance in the direction of travel it seems to me that'd be a bare minimum and 48" or more makes more sense; imagine trying to bring a couch into a building having to lift it over the AC unit. 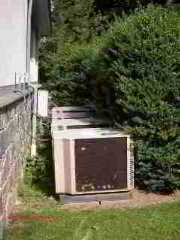 Clearance space above an air conditioner compressor/condenser unit Allow at least 48 in. (1219.2mm) above the compressor/condenser unit. If you're talking about privacy walls or screens at patios or decks, say at a condo, the A/C compressor condenser side-clearance distances specified by the manufacturer (and cited above) need to be respected. In our photo above, from a Minneapolis MN home, these two compressor/condenser units are just about three feet apart - a little close, and that right-most larger compressor/condenser unit is too close to building walls, a clothes dryer vent, and shrubbery. We also see that direct-vented heating appliance white PVC piping is blowing exhaust close to these units. The installation is nice-looking and neat though. Clothes dryer vent outlet: Do not locate a compressor/condenser unit where the clothes dryer vent will blow onto or close to the unit. Lint-clogging of the compressor/condenser's condensing coils is likely to be a problem and the extra warm air won't help the cooling cycle efficiency or equipment life. Move the equipment or move the dryer vent. Also see CLOTHES DRYER VENTING FAQs and see CLOTHES DRYER VENTING for more about safe clothes dryer installation. Heating appliance direct vent outlet: Do not locate the outdoor HVAC compressor/condenser unit where exhaust from a direct-vented heating appliance will blow onto the unit. These four air conditioner compressors were found jammed into a wall niche along a street in Queretero, Mexico. These units may have a short life before needing replacement. Where there simply is not adequate space to provide proper air circulation around an air conditioning compressor or multiple compressors, it may be a good idea to let the building owner know that the units won't have a long life. Is there a specific clearance for an exterior downdraft kitchen vent on the exterior wall to the condensing unit ? Watch out: there could be a more subtle hazard, even a fire hazard: if the compressor/condenser unit's exhaust is upwards out of the top of the unit (as is often the case) and if it blows up into the air intake of the kitchen exhaust fan while that fan is "on" (such that that fan's outlet baffle is normally blown-open by the kitchen fan) the strong blast of upwards air out of the A/C condenser unit may either close off the kitchen exhaust fan outlet baffle or it might even blow backwards back into the kitchen, risking grease accumulation in the kitchen exhaust, backdrafts, odors, even a fire. what is the minimum required distance between a home A/C condenser unit and a fill valve for a home heating oil tank? All of that is subjective, but giving the delivery person several feet (3+) ought to be enough in my opinion. - easy access for your oil delivery driver so she doesn't have to squeeze in between the condenser unit and the wall to reach the fill pipe or listen at the vent pipe; giving plenty of room here for a person to walk and drag a hose also reduces the chance of a splash of waste oil from the nozzle onto the AC unit. is it possible that having 2 heat pumps next to the house could cause a room to be too cold or too hot? The room next to the two units is always too cold in winter or too warm in summer compared to the other rooms in the house. We were wondering if the air coming off the heat pumps against the side of the house would cause this. The heat pumps blow air up and we can see that the air hits the windows on that side of the house. I don't think so. It's true that blocking air flow across a heat pump will limit its effectiveness, but I'd be surprised if that showed up as a difference between rooms in the home. Your question is a good one but I'd be surprised if we could see an indoor effect from air exiting the heat pump. Use the CONTACT link to send us photos of the installation and I may be able to comment further. In our sketch above you can see typical air flow patterns from an outdoor central AC compressor/condenser unit. Air enters at the sides and exits at the top of this unit. So obstructing airflow out at the unit top will also reduce air flow across the condensing coils, shortening equipment life and cutting its efficiency. 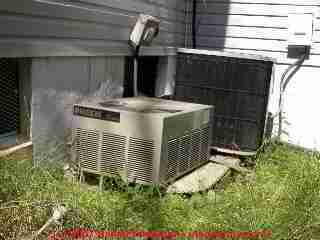 A rule of thumb is to assure that there is at least 4 ft. above the A./C compressor/condenser unit. For example, installing an A./C or heat pump compressor under an outdoor deck might block its airflow (not to mention the noise aggravation). 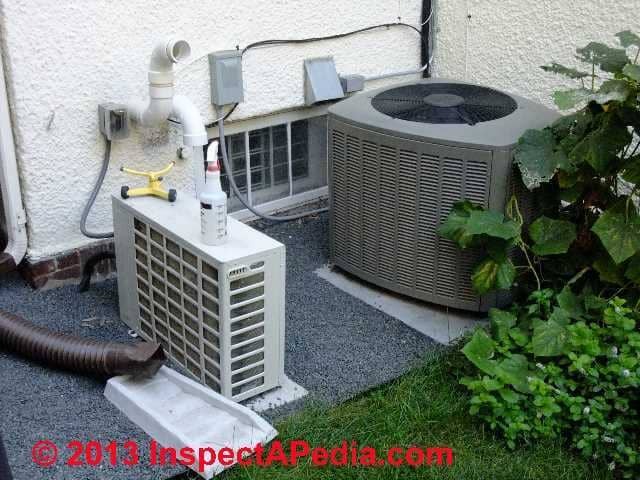 In fact typical A/C or heat pump installation instructions recommend that you locate the unit away from windows, patios, decks, etc., where unit operation sound may disturb the customer. Will an outside compressor unit get enough air circulation if there is a deck built over it? Maybe not, Steve. The manufacturer probably specifies a minimum number of feet of clear space above the compressor/condenser unit to avoid restricting its intake or more often outflow. For example, Lennox air conditioner installation instructions for the compressor/condenser unit typically require 48" of clear space above the unit. The most important clearance distances to respect around an outdoor air conditioner or heat pump compressor/condenser unit are with respect to those sides of the equipment through which air is intended to flow - either "in" to the unit our "out" of the unit. Some outdoor units use a top mounted fan that blows "up" out of the unit, drawing cooling air through the condensing coils at one or more sides of the equipment. For these units both side clearance and top clearance must be respected. But often the condensing coil does not extend through all four sides of the unit. If this is the case, the distance clearance from the side of a unit through which no air is expected to flow is probably less critical - though you should still be careful that multiple units placed too close together are not competing for the same air. In our photo above, air moves into this compressor/condenser through three of its sides, but its "back side" (facing the building wall) is not one through which air moves. My Carrier compressor/condensing unit is installed about 2.5 feet from the wall however there is a gas fireplace exhaust pointed right at the unit. To be more specific, the exhaust would vent to the sides because of it's design. Still, I had a building inspector tell me that's not up to installation code. I'd attach a picture if I could. What do you think? You wrote by email that The gas fireplace direct-vent is 16" from the unit. The A/C or heat pump unit itself is 23" from the wall. That 23" is already an inch closer to the wall than recommended - no big deal, but I do have some worries about the close-by gas fireplace vent. The location of the horizontal vent termination on an exterior wall must meet all local and national building codes, and must not be blocked or obstructed. At least 26" to 30" above ground, depending on the vent type or model. Lower installations can be made, down to 12" above ground but these require installation of a snorkel to raise the outdoor vent termination opening. 72" (Canada) or 36" (U.S.) to a mechanical air supply inlet, & 3' (91cm) above if within 10' (3m) horizontally. The sources for that data do not explicitly specify a clearance from a gas appliance direct vent terminal cap to an A/C compressor/condenser. Possible impact on compressor/condenser unit operating efficiency and life (particularly if both the gas heater and the compressor unit operate at the same time). The effect of blowing hot exhaust from a gas appliance onto a nearby condensing coil's air intake grille might heating the condensing coil thus interfere with the coil's ability to cool the hot refrigerant gas back down to a refrigerant liquid. There might also be a corrosive effect on the condensing coil, though I've not found reference to that problem. Possible safety issues that are exacerbated if a passive or atmospheric gas fireplace heater vent exhaust is actually affected by air flows created by the compressor/condenser unit. Watch out: Drawing air through the heater due to an outside vacuum source OR blowing air into the heater as backpressure from an outside condenser unit air output source would both be unsafe, risking potentially fatal carbon monoxide poisoning, a risk increased should other safety controls be absent or broken. That's to avoid the heat or the air demand from one unit from impacting the other's operating efficiency and life expectancy. But I think that text refers to a mechanical system air supply inlet for combustion air or for air that will be blown into the building interior (such as an air ventilation system). For the installation I see in your photos, the possible effects are not from CO in the exhaust since the compressor/condenser does not involve drawing in combustion air. It does draw in air to cool the condensing coil. In sum, I agree that there is a potential impact between the gas vent and the condenser unit, particularly if they can run simultaneously, such as if the condenser unit is for a heat pump and the gas vent is for a space heater. Watch out: there could be dangerous conditions if the air intake vacuum created by the A/C compressor / condenser unit actually draws air or gases out from the nearby direct vent gas heater or from a passive-vented (atmospheric vented) gas fireplace appliance, that increased draft may impact the safe operation of the gas burner, risking dangerous or even fatal carbon monoxide hazards. Watch out: Separately, if a different compressure unit desigh caused the unit's exhaust to blow into the gas heater exhaust vent, that could prevent safe venting of exhaust gases. Where either these conditions are possible I'd increase the clearance distance to 10 feet or 3 meters. Moving an air conditioner compressor to a distance of about 40 feet from a building won't prevent it from working, but the installer might need to adjust the diameter of the refrigerant lines to be sure that the equipment is working at 100% of its capacity. 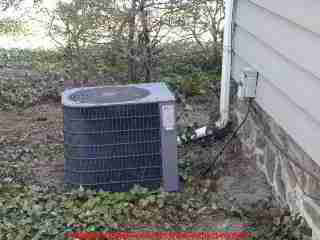 it's not that the air conditioner won't work at all if the compressor/condenser is located at an unusual distance from the air handler/evaporator coil, it's more that it may lose some capacity and have to work harder - meaning higher electrical bills and in extreme cases, shorter equipment life. Some air conditioner manufacturers such as McQuay provide a refrigeration piping guide that gives complete, detailed guidance and charts on refrigerant line sizing (diameter) as a function of length of run. Continue reading at COMPRESSOR / CONDENSER INSTALLATION ERRORS or select a topic from closely-related articles below, or see our complete INDEX to RELATED ARTICLES below. Or see CLEARANCE DISTANCE, HVAC FAQs - questions & answers posted originally at this page. 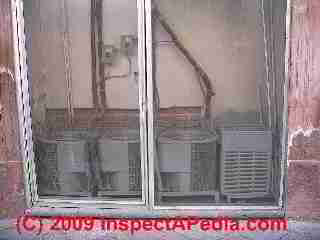 CLEARANCE DISTANCE, HVAC at InspectApedia.com - online encyclopedia of building & environmental inspection, testing, diagnosis, repair, & problem prevention advice.